X25 thermal imaging rifle scope system is a great value that offers high performance in a clip on & combo dedicated thermal imaging rifle scope. 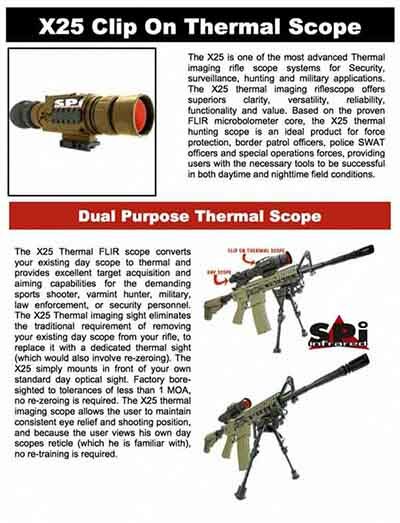 The ultimate thermal scope for hog hunting! Grab one now and hunt those feral beasts any time of day or night! This thermal imaging rifle scope is a solid state advanced rifle scope that can be used as a standalone thermal imaging sighting system or as a clip on thermal rifle scope. If you have been searching for a while for the perfect thermal imaging scope that works as a dedicated thermal sight, a clip on thermal scope and a hand held monocular spotting scope, the rugged X25 FLIR is your all in one multi role affordable solution. The X25 is one of the most advanced thermal imaging rifle scope systems for Security, surveillance, hunting and military applications. The X25 thermal imaging rifle scope offers superiors clarity, versatility, reliability, functionality and value. Based on the proven 17Um microbolometer core, the X25 thermal hunting scope is an ideal product for force protection, border patrol officers, police SWAT officers and special operations forces, providing users with the necessary tools to be successful in both daytime and nighttime field conditions. 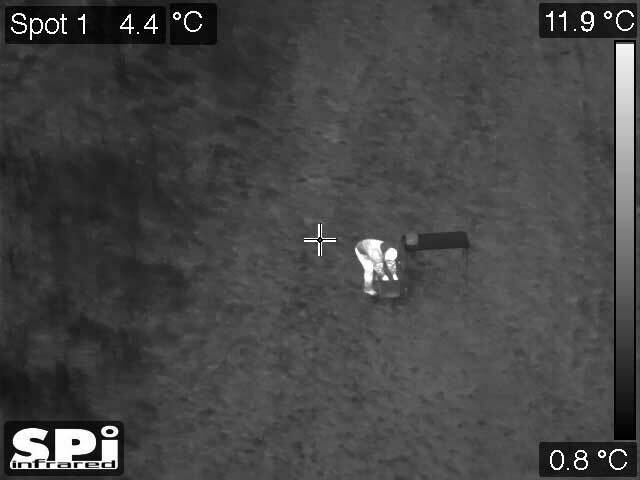 Uncooled thermal imaging cuts through dust, smoke, fog, haze, and other battlefield obscurants. Its position cannot be detected, as it emits no visible light or RF energy and operates without the use of illuminators or IR lights. The X25 Thermal FLIR scope converts your existing day scope to thermal and provides excellent target acquisition and aiming capabilities for the demanding sports shooter, varmint hunter, military, law enforcement, or security personnel. The X25 Thermal imaging sight eliminates the traditional requirement of removing your existing day scope from your rifle, to replace it with a dedicated thermal sight (which would also involve re-zeroing). The X25 simply mounts in front of your own standard day optical sight. Factory bore-sighted to tolerances of less than 1 MOA, no re-zeroing is required. 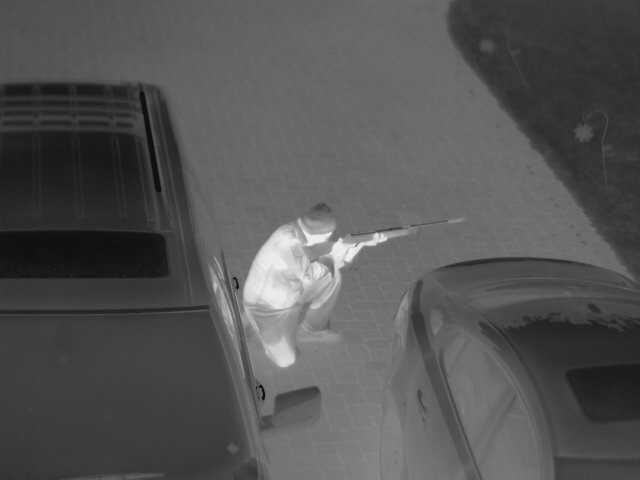 The X25 thermal imaging scope allows the user to maintain consistent eye relief and shooting position, and because the user views his own day scopes reticle (which he is familiar with), no re-training is required. A wireless remote control unit can be placed anywhere on the user’s weapon that is convenient, allowing activation of the X25 Thermal scope quickly and with no fuss. The X25 Thermal sight is equipped with a locking (quick-disconnect) mounting system which provides the user with an easy and quick way to attach/detach the X25 Thermal imaging scope on a standard weaver or Picatinny rail. The X25 scope can also be used as a dedicated thermal scope without any day optics, simple mount the unit on the rifle, sight it in and use it effectively in all day/night applications. The X25 is one of the most advanced thermal imaging rifle scope systems for security, surveillance, hunting and military applications. The X25 thermal imaging rifle scope offers superior clarity, versatility, reliability, functionality and value. 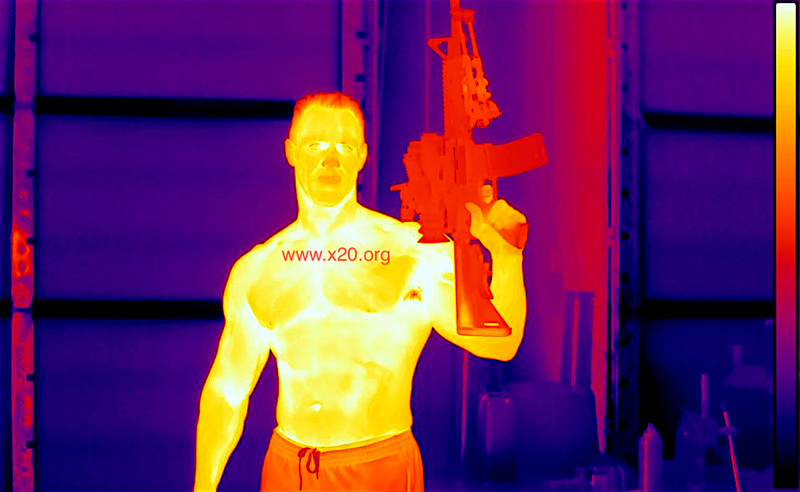 Based on the proven FLIR microbolometer core, the X25 thermal hunting scope is an ideal product for force protection, border patrol officers, police SWAT officers and special operations forces, providing users with the necessary tools to be successful in both daytime and nighttime field conditions. The X25 FLIR thermal boresight scope converts your existing day scope to thermal and provides excellent target acquisition and aiming capabilities for the demanding sports shooter, varmint hunter, military, law enforcement, or security personnel. The X25 thermal imaging sight eliminates the traditional requirement of removing your existing day scope from your rifle to replace it with a dedicated thermal sight (which would also involve re-zeroing). The X25 simply mounts in front of your own standard day optical sight. Factory bore-sighted to tolerances of less than 1 MOA, no re-zeroing is required. The X25 thermal imaging scope allows the user to maintain consistent eye relief and shooting position, and because the user views his own day scope’s reticle (which he is familiar with), no re-training is required.